Lithuanian rabbi and astronomer; lived at Risenoi, government of Grodno, in the seventeenth and eighteenth centuries. In addition to his Talmudical acquirements Jonathan was proficient in astronomy and mathematics. In 1710 a terrible plague visited the town of Risenoi, and Jonathan and his family lived an entire year in the fields. He then vowed that, should he be spared, he would disseminate astronomical knowledge among his coreligionists. To fulfil this vow Jonathan, although he became blind, went to Germany, where the bibliographer Wolf met him in 1725. 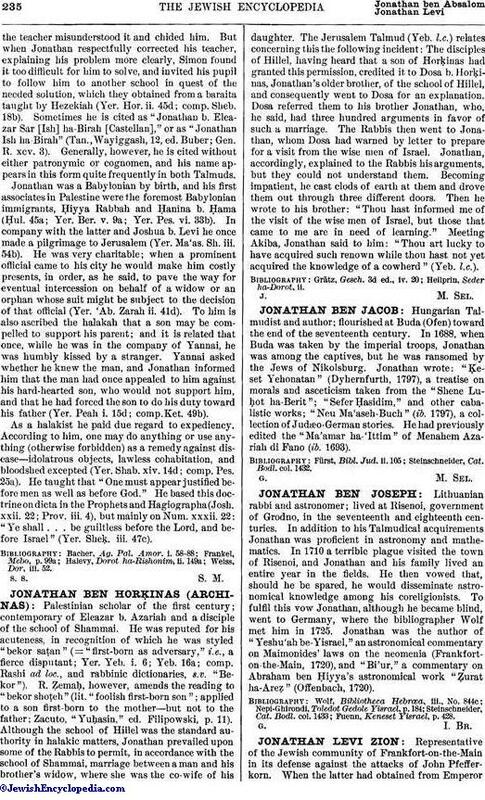 Jonathan was the author of "Yeshu'ah be-Yisrael," an astronomical commentary on Maimonides' laws on the neomenia (Frankfort-on-the-Main, 1720), and "Bi'ur," a commentary on Abraham ben Ḥiyya's astronomical work "Ẓurat ha-Areẓ" (Offenbach, 1720). Fuenn, Keneset Yisrael, p. 428.